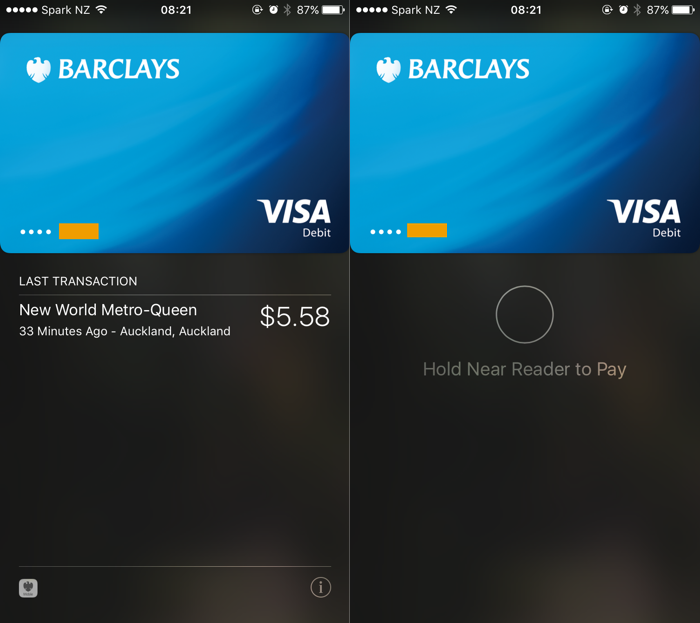 Apple Pay - Apples implementation of NFC based payments, AKA Tap to Pay/PayWave/whatever the card companies are calling it now - is available in a few countries now, but New Zealand isn't one of them yet. Australia is tho! They have had ApplePay via American Express for a while, and today ANZ announced they are turning it on, too. Being a previous UK resident, I still have a bank account in the UK, and my bank enabled Apple Pay a few weeks ago! So I switched my phone over to be in the UK region, added my card (VERY simple process - scan card, enter a few details, enter a pin SMS'ed to me, done), and went and bought some coconut water at New World this morning. Worked like a charm. You just hold your phone up to the terminal, the card pops up (you can change it if you have more than one), and you use TouchId to authorise it. I love that it also shows the last few transactions in the list. This isn't the exact UI - the right side shows pretty much what you see on the lock screen when you go to pay, and the other side is the details from the Wallet app after the fact. I SO can't wait for this to come to New Zealand. Disclaimer: I used to work for ANZ in NZ, who have now announced they are doing Apple Pay in Australia. However, if ANZ New Zealand is talking to Apple, it's not something I was privy to. So this is all "I hope this happens", not "this will happen". Having it available to me via my UK bank account just makes waiting harder. But this is about New Zealand, not the UK. What kinds of things could it be used for if it was available here? First up, there is the obvious implementation of Apple Pay - load it onto your phone, walk up to a terminal, and pay for something. New Zealand has a pretty good penetration of NFC terminals already, to the point where I can use it about 75% of the time. That's only half the story for Apple Pay tho. New Zealand, so far, as pretty good uptake of NFC payments, to the point where I now tap to pay more often than not - usually, the only places which don't yet have it as small coffee shops who can't take the extra credit card fee hit, and usually don't accept credit cards at all. In some cases, the bank they bank with will not let them take credit cards. I think this is something New Zealand got wrong - running the whole thing through the Visa/Mastercard scheme, with it's 2-3% fee for the merchant, as well as chargebacks. We already have the EFTPOS system, which is basically free to merchants. There isn't much technical reason why you can't do NFC-based EFTPOS, but none of the banks have done it - opting for EMV-based debit cards. The UK did get this right (which is a surprise for UK banks) - a debit card transaction, while still going via EMV, is a flat fee of around 18p/transaction (rather than 2-3%), which makes it a lot more attractive for smaller merchants. There's a lot of places which don't accept credit cards, but do accept debit cards. While the uptake of phone-based NFC payments isn't huge, despite all the banks (and Semble) having an Android phone-based mobile wallet offering, card-based ones are becoming more and more popular - I can only see that going up. The other aspect of Apple Pay is in-app payments. Google also does this with Google Payments, tho that hasn't really taken off anywhere except the US (and even then its VERY niche). These API's allow a developer to take payment inside their app, using the users Apple Pay-loaded card. It's similar in in-app purchase, in that the user stays inside the app and doesn't have to enter any card details, but the back end is quite different. With IAP, the developer passes some info to the OS ("10 smurf berries for $9.99"), the OS prompts the user, and reports back to the app. The app never sees payment details, or even the users name - just "yes, they accepted/paid", or "nope". Apple does all the billing at their end, and takes 30% for the trouble. Yup, 30%. You can see why this hasn't taken off for anything but in-game consumables and a few other bits. For anything physical, the margin is unlikely to be close to 30%, so all their margin would go to Apple, and more. This is one of the reasons (there are a few) why Amazon doesn't sell thru an App. Apple Pay changes that. It has a similar - but way deeper and more complex - API, where the developer sets up a cart-type structure (line items, tax, shipping, total etc), as well as requesting some shipping details if needed, and presents this to the OS. The OS uses some standard dialogs, pulling info from device settings (address options, which card to use). The developer gets a "worked/didn't work" result back, as well as any address info, and also (critically) an encrypted token representation of the users credit card. 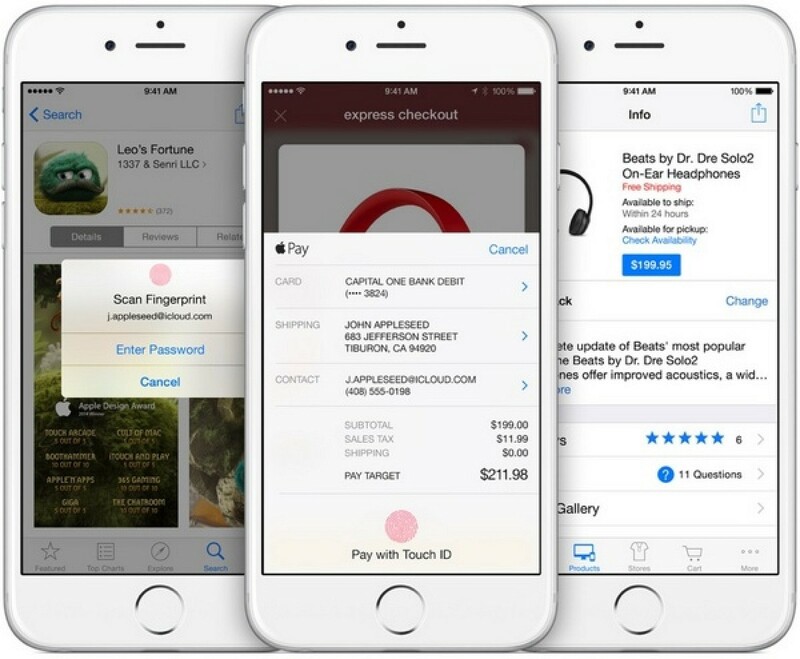 From the users point of view, they are presented with a consistent, Apple Pay branded form, and authenticated using TouchID. This token is the same (or similar) to the one which passes between the phone and a NFC terminal. It's usually one-use, and is tied to the users card in the backend of Apple Pay (or any banks mobile wallet), not on the phone. The app is then responsible for processing this payment - they could hook up with the likes of Stripe, or (on this scenario) PaymentExpress or DPS. The payment provider takes the token and charges it like a normal credit card transaction. The upside of this is that the merchant - the maker of the app - only pays the normal bank credit card processing fees (2-3%), not Apple's inflated IAP percentage. And because Apple isn't responsible for any charge backs - thats between the merchant and the user - there is no restriction on what can be paid for. If you want more technical info, here's a WWDC video from 2015 which expands on it. Pay your power bill in the power companies app - or in something like PushPay, who have an integration with Watercare. Buy tickets for a show in the Ticketek app. No more crappy, slow website. A coffee shop (can you tell I love coffee?) could do a virtual card type system - like Mojo has already - which allows for top ups in the app, rather than in-store. They'd still have to use a QR code or similar for actual payment, as the NFC part of the phone isn't yet available, but thats working now, and is one of the few good uses of QR codes. AirNZ could actually sell you a flight in their app - or an upgrade. A restaurant could have you pay for all/part of your meal at the table, using your own phone. Hospo is a bit low margin for this to happen, but it could. I think you'd need a big chain for this to really work tho. Pizza Express in the UK has something similar. Same with a hotel. Want a quick checkout? Get their app, punch in your room (and some authentication, please), and see and settle your bill from your phone before rushing out the door. citizenM would be a good fit for this, tho their check in process is already pretty smooth compared ot most hotels. Sign up for, and buy, travel insurance while you are standing at the airport. The possibilities are huge once you take out the high fees and restrictions of IAP, and allow the merchants to take the payment themselves. This side of Apple Pay is one which I think a lot of people ignore - and I've written about it before - but I think it's a larger and more useful than just the NFC tap and pay part. Now, can we please have it, Apple and the NZ banks? !